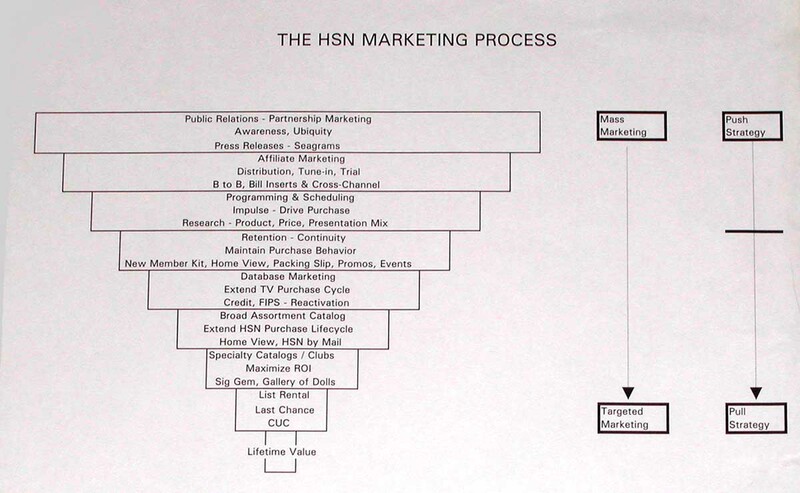 So, we had some good “translation” discussions on the HSN Marketing process document, and the idea that there are a couple of ways to look at “Segments”. 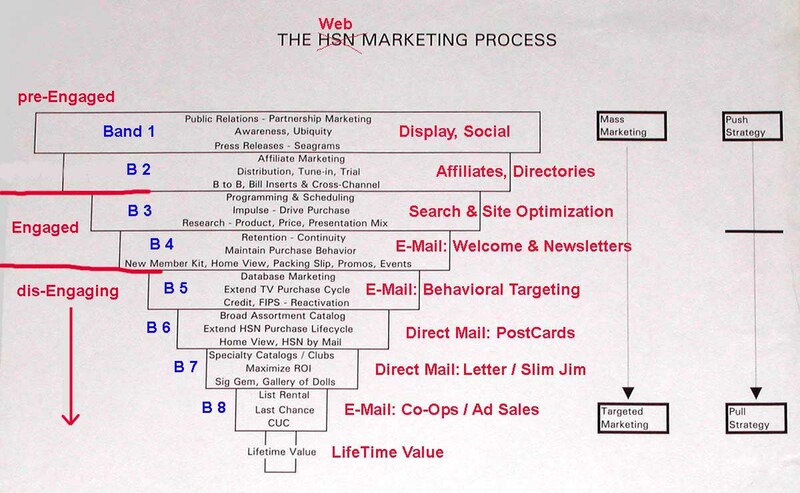 It’s my belief that if you start with Communication Segments (an idea we finally arrived at with the HSN Optimization in 1993) and then move to Visitor or Customer Segments, you will end up with a clearer, more actionable picture in the end. If each Band has a single Objective, and you Optimize to this single Objective, you will end up Optimizing the entire system because Visitors / Customers naturally flow down through the Bands as they pass through the LifeCycle. There’s really no concrete benefit, on either side, to send the same message to all the folks in these different Bands. That approach is inefficient at the least and irritating to the customer at the most! Again, the first 3 Bands generally address non-transactional participants (on the web, #3 is hybird) and are sub-segmented by ideas like Personas, demo or psychographics. The bottom 5 bands are sub-segmented using transactional data, and how “deep” to Market down through these Bands is a Business Model decision. For commerce models you probably Market most of the way down through the Bands. Media models, probably only a couple of levels, because the Value of a “Customer” doesn’t support going any deeper. This approach – basing Contact Strategy on the “Band Status” (um, Engagement?) of a Visitor / Customer rather than simply by a Calendar Date – generally creates a Marketing Cloud that’s much more Relevant to the needs of the Marketing recipients. This is true no matter which Band Customers are in, and provides for greater overall Relevancy if Customers “hop around” between Bands – as some will do if your Marketing is successful. The primary Hop you are looking to encourage is to get folks in the process of Defection – Bands 5 to 8 – to hop back up to Band 3. This is known offline as ReActivation. For Online Marketing purposes, we could call these same Hops up to Band 3 from the lower Bands Re-Engagement. If you can go that far, the logic follows that Bands 1-2 are a pre-Engagement State, Bands 3-4 are the Engagement State, Bands 5-8 are a dis-Engagement State. Remember there is a natural tendency for people to drop down through the Bands – this is the “Process” (AIDAS) part of the model. The great thing about this approach is it doesn’t really matter what metrics you decide represent “Engagement” for your site, what matters is if the Visitor / Customer is demonstrating pre- , full, or dis-Engagement behavior. That’s how you put them in a Band, and that’s how you target the Messaging. In other words, however you define Engagement, the Engaged Visitor / Customer is in Bands 3-4. Measuring pre-Engagement for you is probably very similar to the web analytics thinking you do now on Conversion or (to reference Gary on lead gen) the likelihood of Conversion. Measuring dis-Engagement is simply “how long since they were Engaged”, by whatever Engagement defintion you use. Finally, I’d just like to be very clear on this idea of Analysis and Action by Communication Band and Customer State – the only thing you care about for Marketing is what the Customer State / Communication Band is now, because now is what’s most Relevant. Those of you thinking about tracking “State Paths” or State History (and I know there are probably some) can put that aside, unless previous State is part of your Engagement Metric, or you’re in the Really Advanced Class. Depending on your Engagement Metric, you might have to look at History to establish what a State looks like, the “boundaries” of a State, so to speak. But once you establish the elements of a State, you run the analysis once a week or month and Communicate based on Current State. State is a Snapshot, not a Movie. A Trigger. The reason History is not very useful: in this Model the Band / State is Predictive. There is a natural tendency for the Visitor / Customer to fall down through the Bands. The Bands tell you where the Visitor / Customer is going, what message will be most Relevant to them tomorrow – and that’s why it’s so incredibly valuable as a Marketing tool. Marketing Relevance improves dramatically. I realize many analytics folks are working hard on the Band 3 concepts right now. If I was to pick a next target with the highest potential for ROMI, it would be the Band 4 / Band 5 transition, where you need at least 2 different e-mail streams – one the “business as usual” stream in Band 4, one that recognizes predictive Behavior in Band 5. Here is an easy to get started example: If an e-mail recipient doesn’t open your e-mail for 2 months, recognize that Behavior and change the e-mail stream for this customer to a Band 5 Communication Strategy. Many of you already use vendors or systems with the capability to do this; all you need to do is think through the Customer State, create a Band 5 message, and Test versus the Band 4 message. Test the same idea with different Behavioral windows; no open for 3 months, no open for 4 months, no open for 5 months, etc. Need help with understanding Messaging by State? You can get a good Overview here, with further info here and an awesome, detailed real world Band 5 example here. Comments or questions on this? Do you generally accept or reject this line of thinking? Care to point out flaws, loopholes? But a quick stab for the main site I look after. Consumer Health Information. Pretty much NO budget for any form of direct advertising. Do get some affiliate by targeting medical conferences (GPs, Nurses etc), as well as actual partner websites. But IMHO we would change the bands you reference Jim. In that Band 1 is non existent. And band’s 2 & 3 are equally (heh) engaged. Depending on the affiliation (GP vs Partner Site) even more engaged than Site search. If you GP says check these pages at this site, you’re far more heavily engaged than via a Google search. So the newsletter is a way of keeping in touch/reminding. But if people leave? They leave. And that’s actually a good thing! Arrgh. Sorry, meant: Bands 5+ aren’t relevant! not 4+. Well sure, it makes sense. The interesting thing about working with so many technology folks is how differently they tend to approach problem solving than most Marketing folks – that’s why I really like to have these ideas “spoken back to me” from the tech brain perspective. The model is a Process – which I think is a way of understanding the world many tech folks can appreciate. The Band model reflects a way of thinking about Marketing that’s different from the usual offline approach (Push) that many onliners mimic. 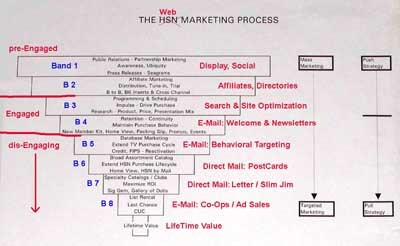 The more appropriate model for interactive relationships is that audiences are in “stages” and communicating to each stage uniquely (Pull) creates a truly optimized Marketing system. In the Bands model, we take the Behavioral psych model AIDAS – Attention, Interest, Desire, Action, Satisfaction – and translate that into an Action plan. The Top 2 Bands are addressing Attention, Interest, Desire. Band 3 is Action. Band 4 is Satisfaction, and to the extent there is a need for ongoing Satisfaction, you’re dealing with Bands 5 – 8. Ultimately, the model is a progressive, proactive plan of Value Creation / Conservation for the business. Not all biz models, as you pointed out, need to address all 8 Bands, though I think if you really tear the biz model apart from a Marketing perspective, you’ll find more need for the lower Bands than you think. So, your biz model relies heavily on the “Distribution” Band 2 – the GP’s and Nurses. That’s where you focus your Attention, Interest, Desire activities – the conference and partner web sites. I’d find it hard to believe nothing happens in Band 1 – no articles or mentions in medical trade magazines? No professional chat board or social media references to the site? And if not, then why not? Given zero budget for general Attention, shouldn’t there be some kind of effort on the PR side to get these Attention vehicles moving for you? Band 3 is the Action taken by the Targets of Bands 1 and 2 – the web site referral to the end patient. In this role, the GP or Nurse is actually the “Landing Page” for the end consumer, because Band 4 is the actual visit by the patient to the web site – the end payoff or conversion. What could you do from a Marketing perspective to influence, facilitate, or “optimize” the human Landing Page that is this medical professional? Are there downloads or other props (pens? magnets? sticky pads?) that could be supplied to the professionals which would facilitate / solidify the handoff from the referral to the actual site visit? In other words, can the Navigation of this Human Landing Page be further Optimized for the end consumer? The desired Satisfaction taking place in Band 4, as you point out, simply is what it is. And assuming the content is what was expected, the Visitor enters Band 5 with Satisfaction, and hopefully a newsletter subscription as part of the Band 4 Action. The newsletter, as you point out, is the primary Retention device and to the extent the customer never needs to return, the LifeCycle is over, you have Defection and final LifeTime Value. Now, I’m not sure where the money is in your biz model, which is critical to understand in terms of activity for each Band. But I’ll go out on a limb and suggest it’s a bit cavalier to at that point go with “we don’t really want people to hang around” and leave it at that. My first question would be, what happens to the Value you just created in that Visitor? Because ultimately the whole Band model is about progressive Value Creation, so what happens to the value of the Satisfaction that has been created in Band 5? Does it just vanish, like snuffing out a flame? Or is there a notion that Satisfaction can be Conserved, that the positive Momentum created in the Visitor could be passed along to the next Band? Is it too early to let that Satisfaction simply dissipate? For example, isn’t there some kind of tell-a-friend or other take away the Consumer could engage in to pass their Band 5 Satisfaction to other people as a Band 6 Retention of the Value Created? Or can you facilitate passing this Satisfaction back to the medical professional in a Band 3 kind of activity, the office visit? To a professional, who upon receiving this Satisfaction, would be more likely to recommend the site to yet even more patients in Band 3? Or, can this Satisfaction be Retained in a Band 1 activity, where in a social setting of some kind, the end consumer expresses this Satisfaction to an audience? Could you drive this social activity through the newsletter, for example? In terms of the model, the above would be a ReActivation or Re-Engagement. The only difference is instead of the Satisfaction being Conserved in the same person, it is passed along and Conserved in a different person, audience, or media. A Transfer. This is why there are so many Bands down in the Satisfaction / Retention area of the model. On first thought, perhaps it doesn’t seem like there is much to do down there for some business models. But before rejecting these Bands as having no ability to create Value, I think one needs to think deeply about the Marketing implications of the Business Model for each Band, and then step through potential Band Scenarios. Maybe you do all the things I mentioned above, but simply have not thought of them in the context of the Bands, so have not realized the potential power of putting resources against truly Optimizing them. Or perhaps you have. Either way, I hope that’s the kind of thinking this model will encourage! Keeping in mind this is coming from a Government perspective. So we’re not trying to monetise visitors per-se, that’s what Tax Departments are for. ;-) Having said that we do *try* and model our costs on a per success/person, to gain a measure of … justification? efficiency? down that path. Good point on the Band 1. We do get references in *consumer* magazines, TV and the like. It does happen, but is rarer in the professional side. I’d forgotten about those. However, similar to recent answer of yours – that _seems_ to be more general PR. I’ve found only very weak correlations to upticks in immediate traffic. Longer Term? Who knows… but we feel it adds value. And yes we do hand loot out at the various conferences and the like. But given you imply the goal of that loot (pens etc) being to gain secondary(?) attention from the end consumers, perhaps we should think some more on just what/how we do that. Hmmmmm x 3. We’ve examined the tell-a-friend concept several times. It comes up for re-examination fairly often. But it does have some seriously major negatives which tend to offset any positives it could drive. Not least being that such a facility is incredibly prone to abuse – in and of itself no so much, but coupled with the type of information we carry – oh yeah. We’ve had nasty incidents in the past with trivial incorrect email addresses and feedback. Tell-A-Friend would be oh so much worse. Scenario Example: Teenagers. Someone has a bad case of Acne. So one of their… “friends” sends them a link to our acne page. Very not nice. Possibly we could wrap sufficing words around any such sending…. These are anonymous visitors for the most part. The userid/login side is badly done – we know that – just haven’t been able to resource fixing/improving. Which if done, would massively solve that issue. Our research has indicated that most people (consumers vs medicos) use the site when they need it. And then not again till they next need it. Which can be 6-12 months. Our visitor analysis has tended to bear this out as well. But thanks again for the suggestions and thoughts. Definitely stuff to follow up! Steve, I’m sure you would agree there is no “right” way to Optimize Marketing Systems; depends on the biz model. What is important for every business model is to step through the scenarios as you have done above, understand which activities might create value and which probably will not, test some things, and then allocate resources to the highest and best use. That’s all anyone could possibly expect. The challenge is, so few managers demand this kind of Marketing Productivity thinking in the first place, and as a result a lot of precious resources get wasted.